I’m not sure how I feel about the flavor Choc-o-Lantern, given that I already know it’s going to taste like a dry brick of icky mockolate. I think green ooze on the inside of the Pop tart would have been cool, but I supposed green ooze is so 1990s and makes me seem old just for suggesting it. Still, these have awesome orange frosting and ghost/bat-shaped sprinkles, so I’m not going to take away many points. I think they look better than they taste, but Pop Tarts never taste as good as I want them to. The Choc-o-Lantern flavor is fudgey and syrupy, and I don’t feel particularly good about myself after consuming an entire Pop Tart. Well, I got 10% of my daily dose recommendation of riboflavin. I guess that’s good. Only 90% more to go! I was always more a Toaster Strudel kid, myself. Those had flaky layers and DIY frosting. Of course, they kind of sucked, too, being greasy pastries that only half-thawed in the toaster, and the frosting came in a frustratingly small squeeze packet that was never enough. At the end of the day, I was thrilled to see another contribution to spooky breakfasts, next to Monster Cereals and Halloween Crunches. It feels good to know I could eat Halloween breakfasts all month long. And I have obliviously, naively gone about my life, enjoying that feeling all week, until I came across a piece of news that shattered my peaceful existence. Yes, Halloween breakfast is that serious. It’s the most important meal of the day. Yes, I thought it had it all. The sun was shining, the coffee was hot, and Choc-o-Lanterns were in my kingdom. And then I discovered Pumpkin Pie Pop Tarts exist. And I cannot find them. I’ve frantically checked the Pop Tart section in every store. Do you see it says Limited Edition? LIMITED EDITION. That means it’s going to stop, like tomorrow. These are the BEST!!! They taste just like pumpkin pie! The pumpkin pie PopTarts are the best I have ever had! Seriously,Ive been eating PopTarts for decades. These really taste just like a pie. They have tremendous flavor right out of the package untoasted. They are the best ever. Ok, pumpkin pie pop tarts are the BEST FLAVOR EVER!!!!!!!!! the pumpkin pie flavor pop-tarts are right on!i love them they are me absolute favorite ever! please keep bringing them back! i dont know how you make them taste exactly like pumpkin pie right down to the crust, but keep up the amazing work! Are you on the edge of your seat yet? Are you halfway out the door to go search in your local stores before you finish this sentence? I am. My heart is racing. Clearly, this is like the Holy Grail of Pop Tarts—a Pop Tart that tastes like what it’s supposed to represent. I’ve been burned by Vanilla Milkshake and Apple Pie flavors my whole life. This one is IT, folks. The God Pop Tart. I NEED these. And look. I NEED a little pilgrim hat for my toaster, too. Do those exist? Ugh. WHY IS LIFE SO HARD. But wait. Now that I’ve stopped hyperventilating and sweating through my underwear over it, I take a closer look at the boxes. The pumpkin pie flavor is actually going for a fall-themed/Thanksgiving tie-in. Since it’s only October 10th, I’ll give the flavor more time to arrive in the stores. I’ll hold off from desperately ordering four boxes off Amazon. For now. 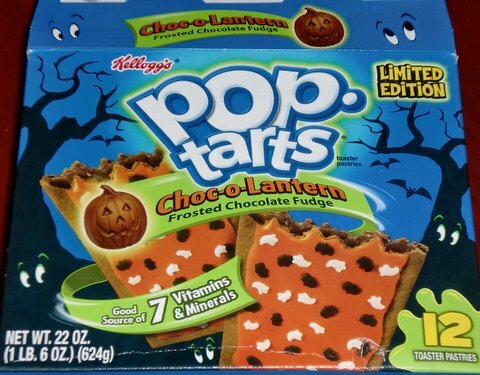 Maybe I should consider myself lucky that I was able to find any Halloween Pop Tarts at all. Maybe I’m acting like a spoiled brat when I say that Choc-O-Lantern should have had green ooze. Gee, maybe I should go eat some half-thawed, non-Halloween-themed Toaster Strudels. Hey, maybe I will. And I’ll pathetically draw ghosts on them with the squeeze packets. In the meantime, I’ll get busy sewing a pilgrim hat for my toaster. I bought some Pumpkin Pie Pop Tarts here in Akron, OH. I haven’t tried them yet either. We have them here, but only at Target. Hmm I see a Target run in your future. I have not been a fan of Pop-Tarts for years. I just don’t have breakfast every morning. I have to be up for at least one hour for food to even agree with my stomach, and I’m not hungry when I wake up. I’ve noticed, the closer you eat to bedtime, the earlier you’ll wake up hungry. And I hate waking up hungry. I showed the Pumpkin Pie pop tarts to my husband…. he is beside himself with joy. I may have to resort to ordering them off amazon. To give credit where credit is due though, I did find O’Boisies potato chips on Amazon. That was a great day for me. Not sure if we have them here in CT, but I’ll check. If we do, I’ll totally send you a box! thanks for your kind offer.. but I just found them today in Target.. whew. I can finally sleep now. Just found an entire shelf full of pumpkin pop tarts at Aldi (Chicago Suburbs). I haven’t tried them yet.